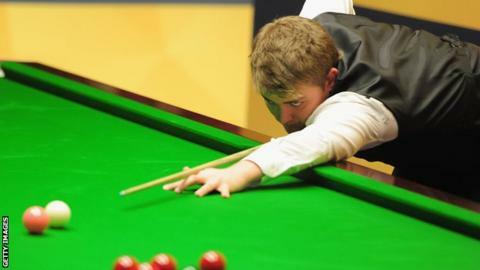 Welshman Michael White can become a world champion, according to five-time winner Ronnie O'Sullivan. The pair are both through to the last eight of the Welsh Open at Cardiff, with White beating defending champion John Higgins 4-1. "Michael White is an amazing player. He has absolutely everything," O'Sullivan, 40, told BBC Wales. "Wales is going to have another world champion... maybe a multiple world champion." O'Sullivan added: "John Higgins behind Stephen Hendry is the best player I have seen and he has lost to Michael. "He [White] is fearless, he plays everybody like they are the same. He doesn't care who is sat in that seat against him and that is a gift. "Michael is now a top player. He's definitely knocking on the doo. If he won the world title this year I wouldn't be surprised." Englishman O'Sullivan had little trouble beating China's Yu Delu 4-1 after losing the opening frame. White, 24, described the victory over four-time world champion Higgins as a career highlight. "It is a fantastic win, [it] would have to be up there with the best of my career," White said. "I am feeling very relaxed and laid back and it showed in my performance. "To get that win in my home event makes it more special. It is good for Wales and the tournament. "Who knows, maybe a Welsh player could get to the final."